I stopped watching House of Cards in its 3rd season. 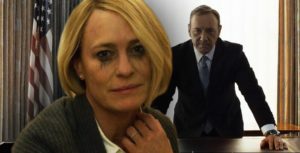 I just couldn’t watch President Underwood do what he continued to do with such contempt for others. The other part that I couldn’t understand was the relationship between the President and his wife – was she really as ambitious as he? When Kevin Spacey was ousted from the show, I decided to, at least, watch this last season. Claire Underwood as president was just as complicated, complex and controlling as her late husband who loomed darkly over every move she made. P.S. Diane Lane was a character I haven’t seen her be before – excellent acting. And I loved the theme of women in power. I too loved to see the dynamics of powerful women in this series, even though their characters prove most sinister. Another series which follows a similar tack is Ozark. Dark, dark, dark, but full of intelligent intrigue and strange adherence to certain values (such as loyalty to family and not getting too greedy or full of oneself) that keep us rooting for otherwise amoral, unsavory characters. Fascinating storytelling! 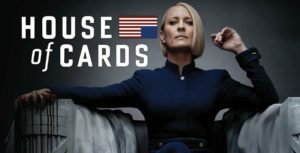 I just finished watching the final season last night, and I have to say, the show never moves toward the predictable (well, other than Claire manages to cease the upper hand in any situation). That being said, the final scene stunned me. Robin Wright plays Claire brilliantly, and what a host of stellar supporting actors! Unfortunately, it seems some of the themes hit frighteningly close to home in our increasingly digital and divided society.